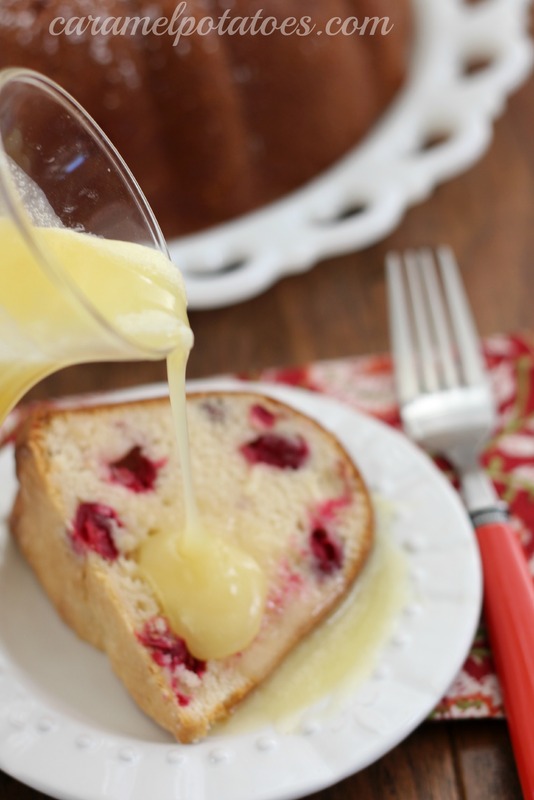 Looking for the perfect holiday dessert? This Cranberry Cake is a vintage recipe from years ago, but still has the most amazing flavor and presentation. 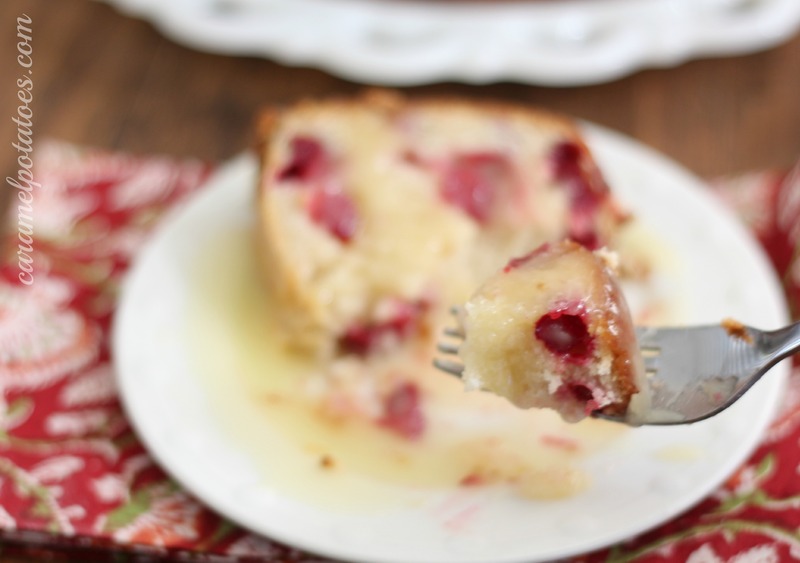 The simple cake is moist, delicious, and so pretty with the addition of beautiful red cranberries. The main attraction here, however, is the Hot Butter Cream Sauce – one bite says it all- wow! 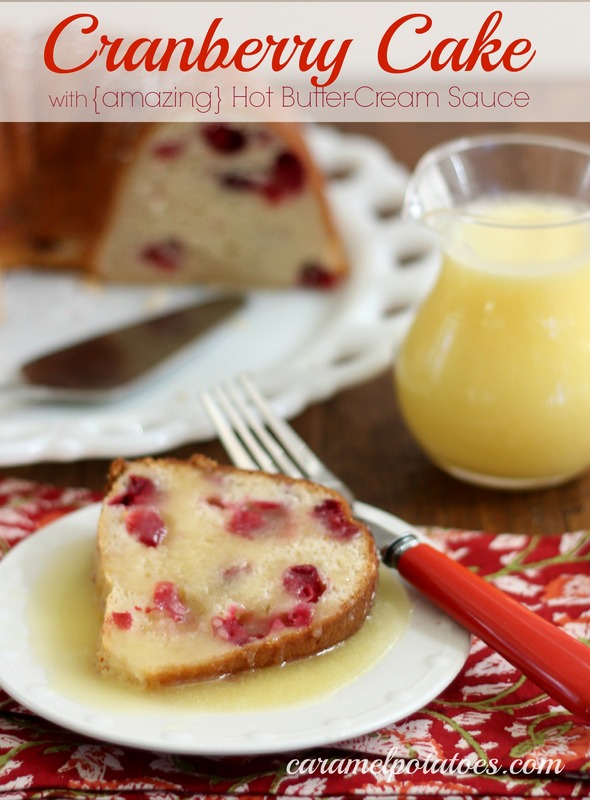 The sweet, creamy sauce balances out the tart cranberries perfectly and is just plain sinfully good. I love this cake for the dessert table at Thanksgiving because it blends perfectly with your pumpkin and pecan pies; and of course it is beautiful for Christmas dinners and parties! You just can’t go wrong with this one. Make it up now and stash it in the freezer for when the holiday rush hits. Be sure to see our Bundt Cake Hints, Tips and Printable Gift Tags here. Preheat oven to 325 degrees F. Grease and flour Bundt pan. Mix together the flour, baking powder and salt. Set aside. In a large bowl, cream together the 6 tablespoons butter and 2 cups sugar until light and fluffy. Beat in the flour mixture alternately with the evaporated milk. Stir in the cranberries. Pour batter into prepared pan. Bake for 50 to 60 minutes, or until a toothpick inserted into the center of the cake comes out clean. Let cool in pan for 10 minutes, then turn out onto a wire rack and cool completely. To make the Hot Butter Sauce: In a saucepan, combine 1 cup butter, 2 cups sugar, and cream. Bring to a boil over medium heat, reduce heat and let simmer for 10 minutes. Remove from heat and stir in vanilla. Serve cake with a generous portion of the Hot Butter Cream Sauce, allowing it to soak into the cake . . . even then you’ll still want a little more! This is so pretty. 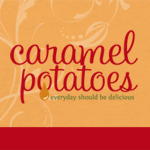 I’m trying it this weekend as a trial for Thanksgiving!